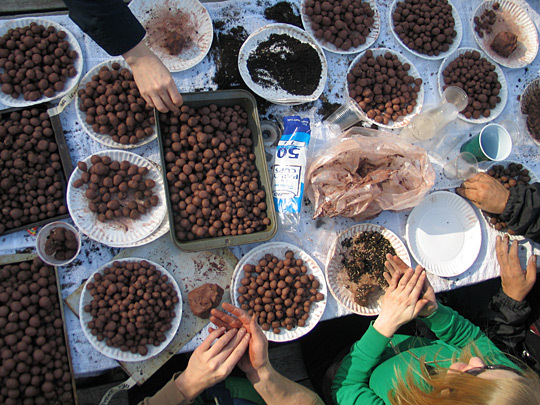 Environmentalists Adopt New Weapon: Seed Balls Activists in Brooklyn, N.Y., are throwing seed balls into abandoned lots and dirt piles. 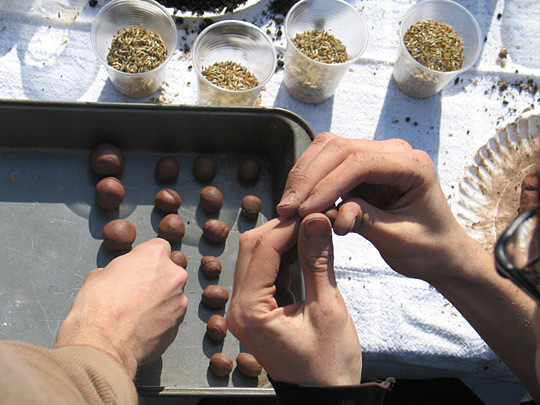 The balls — made of mulch, seed mixture and red terra-cotta clay — break down in the rain, and the seeds germinate. One activist calls it a way to take control of a small piece of the planet. 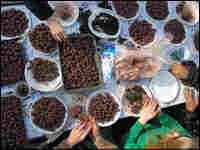 Seed balls are made out of mulch and seeds mixed together and knead into a red terra-cotta clay. 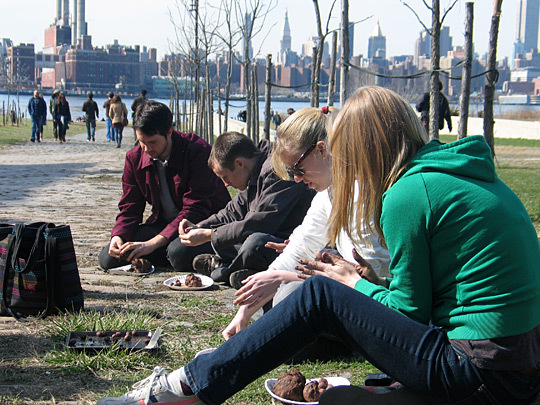 Volunteers help make seed balls at a Neighbors Allied for Good Growth event in Brooklyn, N.Y.
Emily Gallagher, a NAG member who specializes in open space issues, says that seed balls allow people to take control of their small piece of the planet — and that's why so many people are getting involved. It's a technique for planting in abandoned places and often inhospitable land that was developed in Japan by Masanobu Fukuoka, a pioneer in "natural farming." Emily Gallagher, a NAG member who specializes in open space issues, says it's easy to make seed balls. "First, we mix the mulch and a seed mixture," Gallagher says. "We try to pick a seed that is native to the area and can withstand drought. We mix those together, and then we knead it like bread into a red terra-cotta clay. It is important to use the red terra cotta, because other kinds have different chemicals in it that affect growth." 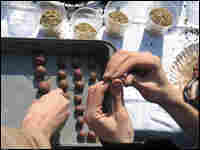 The mixture is rolled into little balls, which then has to dry. The group then puts them in bags and distributes them. The mud and clay protect the seeds from being eaten by birds and rodents. After three to five rains, the balls break down and the seeds germinate. The seeds used in Brooklyn are mostly wild cornflowers, lovely blue daisy-like flowers often seen by the roadside. The Brooklyn neighborhoods of Greenpoint and Williamsburg have been gentrifying. There has been lots of development and little attention to open space. But with the economic crisis, a lot of development is now on hold. Michael Freedman-Schnapp, one of the co-chairs of Neighbors Allied for Good Growth, says that community gardening and the "guerrilla gardening movement" of the 1970s "was a reaction to all the abandonment in the city at the time." "We are at the end of a development boom, and it is clear that the city's resources are going to be constrained," he says. "They are not going to be able to take care of everywhere in the city. And so the city is going to have to rely on citizens stepping up and taking care of their own surroundings." There are a lot of fenced-in areas in the neighborhood. On the water front, there is a chain-link fence that has a sign with the little maple leaf that signifies a city park, but it's locked. A new re-zoning plan has promised that it will become a park, but nothing is happening yet. If you look around the neighborhood, you can see people sneaking into abandoned, trash-filled areas near the river, finding places to fish, to jog and to walk their dogs. Gallagher says that seed balls allow people to take control of their small piece of the planet. She says walking around on a Sunday morning throwing seed balls is fun and easy. "I think it is really important to break down these larger tasks — of taking back our neighborhoods and cleaning up our open spaces — into tasks that are completely doable," she says. Most people, of course, still have no clue what seed balls are. Back in 2003, during a World Trade Organization protest, a dozen police surrounded a parking lot. They were concerned that these strange pellets they found might be dangerous weapons. They threw them against walls and watched them "explode." It took them a while to figure out that they were seed balls.